Listed in 2003, Saved 2007. Samuel Pope, a blacksmith and member of the Quaker community who settled in the Salem area, had this fine Georgian style home built around 1740. This building is one of the few pre-revolutionary residences remaining on Boston Street and a rare surviving example of housing for Salem’s early, much persecuted, Quaker community. 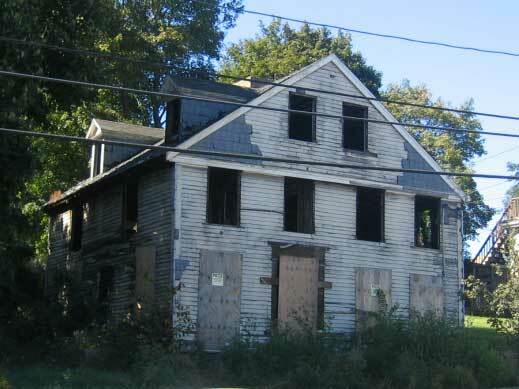 The image to the left shows the condition of the house in 2003 when Historic Salem has worked with the Gallows Hill/Ward 4 Neighborhood Group, neighbors and a butters to save this property. The building was, unfortunately, stripped of most of its exterior and interior detail, but the two and one-half story home still presented an appearance typical of the Georgian style including a traditional 4 X 2 bay facade with second story windows flush with the roof line and a massive interior chimney. The neighborhood group, supported by Historic Salem, Inc. opposed the a request for a variance to demolish this property and build a 6-unit residential building. Due to opposition the proposal was subsequently withdrawn and a new owner purchased the property. Upon undertaking work on the house (and removing much of the historic fabric of the 1740’s building) the owner recognized the need to preserve and protect the building. The Gallows Hill/Ward 4 neighborhood group supported a request for a variance for an additional condominium building in the rear of the property, on the condition that Historic Salem was given the building and allowed to protect the Pope House and ensure its future. In 2005, as owners of the building, Historic Salem participated with Gallows Hill/Ward 4 Neighborhood Group members to select a buyer to restore the house. Proposals were evaluated based on the ability to meet Historic Salem’s requirements for the restoration of the exterior. Raymond Young, a Salem resident with experience in the renovation of historic buildings, was selected as the re-developer. The renovation of the interior as a 2 family residential dwelling will be completed in the spring of 2007. All work was done in accordance with specifications defined by Historic Salem. A Preservation Restriction held by Historic Salem will protect the completed project. 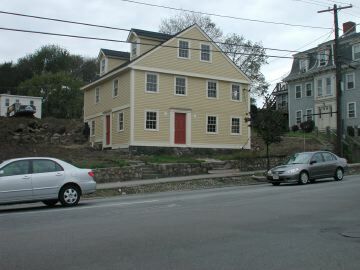 The restored Pope House (image left) now stands as a proud contributing member to Salem’s historic Boston Street.